Online sharing service Shareaholic just released new data showing that Pinterest is now beating out Twitter, StumbleUpon, Bing, and Google in referral traffic (not Google organic, of course). The study is based on Shareoholic’s network of over 200,000 publishers, which reaches more than 270 million people monthly. The company has been keeping its eye on Pinterest this year, finding in January that the emerging social network had topped Google+, LinkedIn and YouTube combined, for example. And in February, Pinterest beat out Twitter for the first time. The new data shows that Pinterest’s referral traffic climbed from .85% in January to 1.19% in June. That’s nothing compared with Google’s organic search (46.8% in June), but it tops Google’s referral traffic (1.09%). For the purposes of this study, Shareaholic is defining Google referral traffic as those referrals that don’t come through organic search or AdWords, but on other Google properties, like Google Groups or static pages on related Google sites. It does not, however, include Google+. 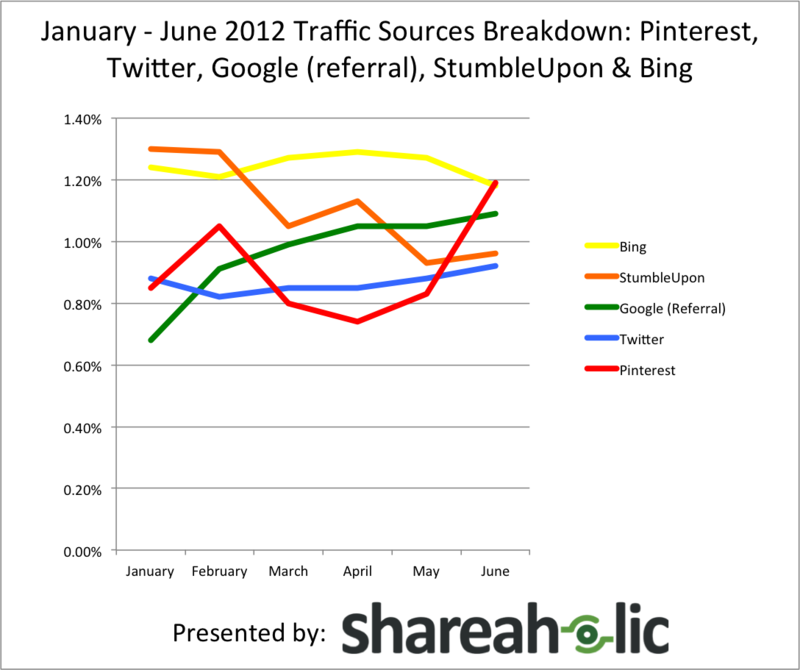 Pinterest is also topping Bing, StumbleUpon and it’s still topping Twitter, too. Twitter itself climbed from .82% in February to .92% in June, but is still falling short of Pinterest’s 1.19%. The big takeaway from this news, says Shareaholic, is that content creators should definitely have Pinterest on their radar as an additional form of SEO, but it’s not a replacement for keyword building by any means. 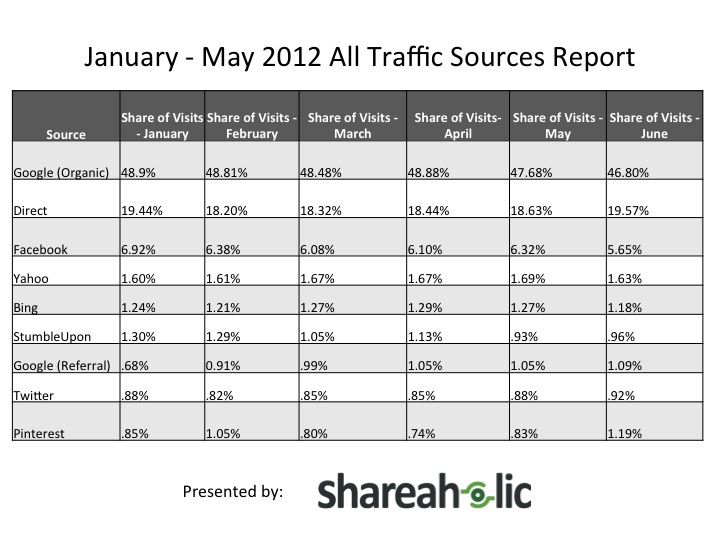 Google organic traffic is still by far the biggest source of traffic on its network, sending nearly half of referrals. The more interesting detail here, perhaps, is that Pinterest is now beating StumbleUpon in referrals, a company which has long been seen as a under-hyped, but key driver of website traffic. StumbleUpon reached 25 million registered users in April, and was seeing around 1.2 billion Stumbles per month at that time. Meanwhile, Pinterest doesn’t talk user numbers but is currently estimated to have around 20 million users, based on third-party sources.